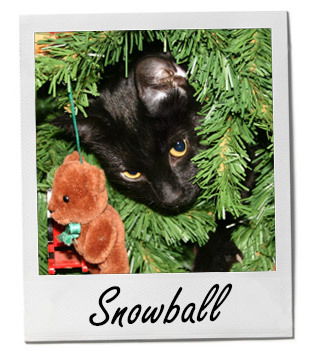 Snowball (yes..a black cat) was a starving feral kitty in the woods that our family rescued. She enjoyed her first Christmas as a housepet...a little too much. She attacked the tree and stole decorations. We strung the lights on the tree only when we were right there. In this photo she hid inside the tree and tried to steal the decorations as I was adding them (before that she spent a week climbing our bungee corded in place plastic tree!). She's a handful but also super adorable and makes me laugh! She shares her new life as a housecat with our other cat, Mimi, and our Border Collie mix, Misty.